Puzzle: A lovely serene scene of a countryside in autumn. Calm blue water reflecting the sky, the covered bridge, the sky and bright tree leaves border, and the boat are distinct regions that make a good start for the assembly. Good lighting is a bonus for the subtler transitions of colour among the trees and grass. 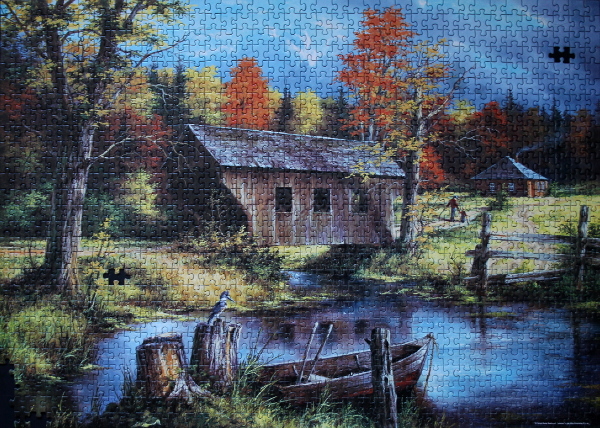 1000 pieces, autumn, boat, cottage, lake, landscape, Mega Puzzles, puzzle, Rudy Reichardt, trees. Bookmark.